Info "It’s creepy how much the Form Baton looks like the Wii Remote. Copy the movements on-screen." Wiipeat After Me! 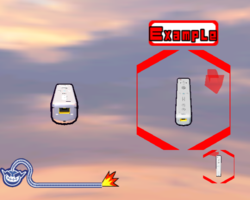 is one of 9-Volt and 18-Volt's Microgames in WarioWare: Smooth Moves. Its name is a pun on “Repeat after me”. The objective is to copy the movements on-screen of the Form Baton with one's own . 1st level difficulty: Two positions. 2nd level difficulty: Three positions. 3rd level difficulty: Three vertical positions. This page was last edited on February 20, 2018, at 16:38.